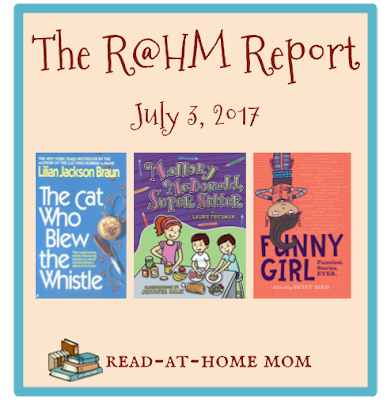 Other than a quick update about the Deal Me In Challenge (in which I have since once again fallen behind) I haven't checked in with a Read-at-Home Mom Report since June 5th! Here's how things have been going since then. Though I have been reading a lot of adult books (for me) this year, I've recently taken a bit of a break. I have a whole stack of paperbacks in my bag and on my nightstand, but I just never seem to make the time to get really into them. 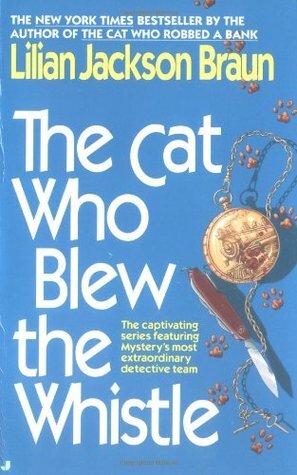 I did finally finish The Cat Who Blew the Whistle by Lilian Jackson Braun (review on Goodreads), but not Novena for Murder, despite how much I like the writing, so I think I'm just in a grown-up reading slump. I am sure it will pass, but in the meantime, I've been reading a lot of kids' books. It had been a while since I checked anything out from Hoopla, and I realized that I had fallen behind on Laurie Friedman's Mallory McDonald series and April Sinclair series. I was trying to catch up on my Goodreads challenge goal, and I knew these were quick reads, so I checked them out and read them on my phone over a couple of days. I reviewed High Five, Mallory and Mallory McDonald, Super Sitter on Goodreads. A Twist of Fate (which I also reviewed on Goodreads) and Life, Loss, and Lemonade concluded the April Sinclair series with some sadness involving April's grandmother, but they also showed a lot of growth and change in April that showed how far the character has come since the first books of the series. I was glad to see her story end on a hopeful note. And part of me hopes that maybe the author will revisit this family for a spin-off series involving one of the other Sinclair sisters. During this same time, my hold on Go Jump in the Pool! by Gordon Korman came through on Open Library, so I zipped through that one as well. I don't think I ever finished the series as a kid, but they are still very nostalgic reads for me, and always very light and quick. The fundraising schemes devised by Bruno and Boots in order to buy a pool for their school were ingenious and fun to read about, and I love the unlikely way the happy ending comes together. I'll be borrowing the next book before the summer is over and I plan to blog about the entire series once I finish it. After finishing these borrowed e-books, I moved on to digital ARCs, finishing both Let's Pretend We Never Met by Melissa Walker (reviewed here) and Almost Paradise by Corabel Shofner (review to be published Wednesday). I read this because everyone has been talking about it, and I love LeUyen Pham's style. I liked it more than expected and may wind up reviewing it here if I have time. A lot of tween girls should be able to relate to the subject matter. This was really less a book of funny stories and more a book reminding girls that people don't think they are as funny as boys. Most of the funny people I know are female, and my own three-year-old told me just this week that she is going to start telling people how funny she is in case they haven't noticed, so I guess I just don't get that worldview. I also hate books that try to indoctrinate kids into a particular brand of feminism, so though I liked some of the stories, the overall vibe of the book felt uncomfortable. As I mention in my Goodreads review, this was a solid story about summer camp pranks unfortunately marred by the inclusion of a ouija board. I really wanted it to be as good as The Classy Crooks Club, also by this author, but it just wasn't. This prequel to the Anna Wang series made me roll my eyes a little bit, only because the teacher in the story decides to focus on recycling and environmentalism instead of academics. I am completely out of patience for agenda-driven children's books, so even though I love these characters, the book fell flat for me. This series has always handled a variety of issues without becoming preachy; it's a shame this one didn't do the same. Dessen never disappoints. I will be reviewing this one very soon, so I'll save my thoughts until then. Finally, we listened to two audiobooks in the car on our way to and from North Carolina: Beezus and Ramona and From the Mixed-Up Files of Mrs. Basil E. Frankweiler. I'll be reviewing both sometime this month. Since it's Monday, I'll be linking up today with It's Monday! What Are You Reading? at both The Book Date and Teach Mentor Texts / Unleashing Readers. Well very productive with the kids' books and I am sure your adult reading will get back into gear in its own time. Many children's books are excellent reading anyway. The two audiobooks really are two classics and I bet were fun to listen in on. I've noted some of these series for my granddaughter who's just at that chapter book point, Katie. They do sound just right. Gordon Korman is a popular request at the used bookstore where I work. I'm often asked if we have books by him. And thanks for the words about Sarah Dessen. I need to catch up with some of her books! I loved all the other books about Anna, so it might just be that this one didn't live up to my expectations. I agree that the environmentalism was not the main focus of the book, but it still felt forced and preachy in a way I didn't like. And the message about diversity and friendship was delivered so well by the other books, I didn't see the point in even writing a prequel that doesn't really introduce anything new. I wish the author had had the opportunity to write more books about Anna as a middle schooler before she passed away, as the later books of the series were so wonderful, and great alternatives to a lot of the more negative books about middle school. I will definitely miss this series. You and I are reading kindred spirits! 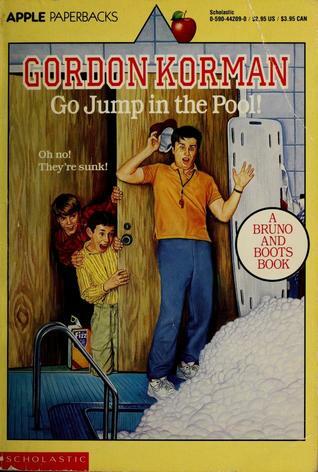 I hadn't realized Gordon Korman has been writing as long as he has. I loved the audiobook of From the Mixed Up Files... 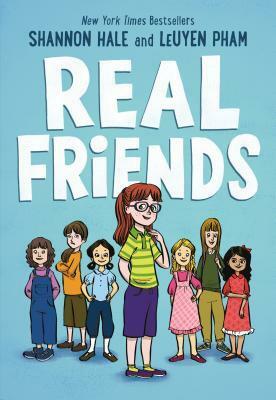 I have a copy of Real Friends (well, my daughter does, but she's let me read it). I loved Real Friends! I know that it'll be really popular with middle grade students, especially those that love Raina Telgemaier's books. I read my first Bruno and Boots story last year - The Zucchini Warriors. It was a lot of fun, and I'm sure my little guy will enjoy them when he gets older. Have a great week! Gordon Korman started writing while still a kid, so he had a head start. I remember thinking the Bruno books were exotic, because Canada is a foreign country. My brother once told me that on a dating site if a woman lists that she is looking for someone with a sense of humor, she means someone who makes her laugh. If a man lists the same thing, he means someone who laughs at his jokes. I guess that's the same place the Funny Girl author was coming from. Real Friends looks like a book I'd definitely enjoy! Will have to be on the lookout for that one.